It's best to take advice from people that actually know these products. A rider who has tested the scooter in the field is worth a lot ore than a salesman in a store. This is where product reviews come into their own because they tend to be written by people who have direct experience riding a particular product. As well as this website, we recommend that you head on over to Amazon.com and read all the reviews thoroughly. Purpose - commuting or leisure? Do I need an adult version or a teen product? 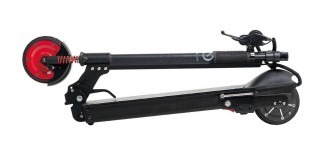 Do I need to fold the e-scooter for storage or carrying? What kind of mileage range do I need? Do I need a small-profile product or is a larger machine OK? Is a fast charge time important or is it fine if it takes all night? 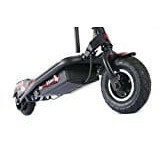 Does my electric scooter need to have air-filled tires? Can it be put in the trunk of my car? Do I need a fastsmachine or is a slower speed OK? Can I get spare parts for the scooter? Do I know where I'm going to store the scooter? We took a powerful off-road hoverboard out for a test drive and gave it the once-over in a detailed look at why the all-terrain hoverboards might be worth your money over the regular less-powerful models. If you need power, sturdiness and to travel over gravel, grass, mud and in wet conditions then you should really consider an off-road hoverboard. All models I looked at have some level of water resistance, all are UL2272 certified for safety and they vary between 2 x 350 watt motors to 2 x 400 watt motors. More bang for your buck and more fun without having to stick to riding on the road. The E-twow/Uscooters Booster Scooter makes the Top 15 Electric Scooters simply because people rave about it. It has great ratings and has been popular for over a year now, so they are definitely doing something right with the Booster Scooter. 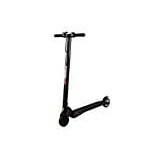 It has an exceptionally good balance and is lightweight enough to be used as a regular kick scooter. Just use the power boost when you get tired and need a break from kicking. This electric scooter is fast-charging and the components are waterproofed, but of course we don;t recommend that you take an electric scooter out in the rain when it's slippery. The warranty is excellent at one year and the scooter will provide a smooth ride as it does have dual suspension. 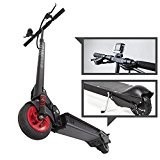 There is not much else to say except do read the reviews on Amazon because people absolutely love the E-twow/Uscooters Booster Scooter! Micro are known for their high quality product and the eMicro is no different. An interesting feature is the fat rear wheel which provides more traction to the road. The emicro One has a good spec with a top speed of 12 mph and a range of 10 miles. It's more than enough for any daily commute. 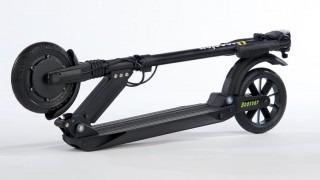 It is also extremely lightweight at around 16lbs and it does seem than Micro Kickboard have tried to make the lightweight a specific feature of the scooter. It has very slimline looks so the batteries are extremely compact and hidden away under the kickboard. You also get the incredible 2 year warranty which shows exactly how confident they are about the eMicro One. It will also travel well because, as far as I know it's the only TSA approved electric scooter on the market. If that's the case, it's unique and a worthy travel companion for anyone who loves to ride high quality electric scooters. The EcoReco M5 Electric Kick Scooter for adults is probably the most energy efficient electric scooter on the market today. It comes with 5 Star ratings and top reviews. Expensive, yes but it's worth it because it's a tried and tested second-generation adult scooter that is compact and reliable. Fold it under your desk to charge it while at work. The EcoReco M5 has a good range and speed considering that it's such a compact vehicle and it's a comfortable ride with a nice digital speedo display on the handlebars. The Reddie is the best looking, high quality folding adult electric scooter on the market. The top-quality Reddie has the good looks to attract admiring glances and it's a stylish way for an adult to get around. The Reddie can fold and as such can be taken onto a bus or a train for that 'last mile' commute to the office. It's not too heavy at 22lbs so can easily be carried up strairs, into an elevator or put into the trunk of a car. 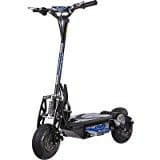 In any case, if you need a top-class gadget e-scooter that will get you around the neighborhood and more at speed then this is the right scooter to choose. As with all e-scooters it's wise to do regular maintenance. Oil bearings, tighten nuts and keep the machine clean. Read the full review or just the summary below if you are short on time. 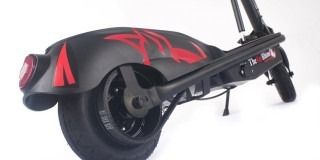 Another top-selling kids electric scooter on the market is this magnificent Razor E100. Great quaity and a fun ride for children from 8 to 13 years old. 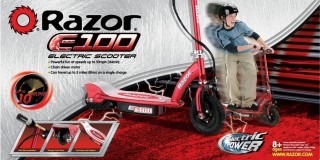 The Razor E100 is a great budget buy and has been one of the best seller children's e-scooters for a few years now. It does it deserve it's top spot as it reall is good value for money and comes with the safety assurance of a top Brand like Razor. The E100 comes in a range of nice, bright colors. Bright Pink, Blue, Sweet Pea Pink and Red. 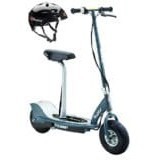 It's recommended for ages 8 and older with a maximum rider weight of 190lbs. 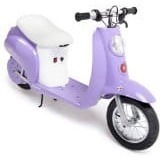 The Pocket Mod kids retro electric ride-on scooter and it's cousin the Sweet Pea Pocket Mod look just like the real thing but smaller! These cute Italian Vespa style electric scooters for kids even have a brother - the Pocket Mod Vapor. The Vapor is cool and all-black. Made for modettes and mods alike, Razor really have the design nailed with the Pocket Mod. 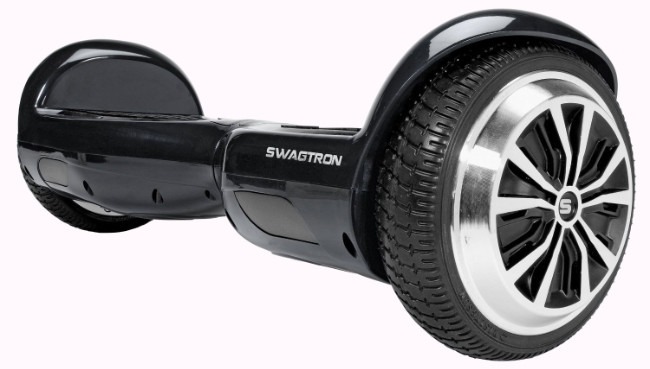 Swagtron are well-known for being the people that brought the hoverboard to the mainstream. Since the troubles with the hoverbord batteries in 2015, they changed their name and started producing safety-certified electric scooters and hoverboards. 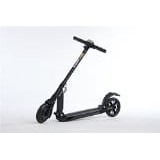 Swagtron clearly have great cool appeal with their Brand name and celebrity endorsements but their is something special about this Swagger electric scooter and a good reason that it's a best-seller. You can travel for around 15 miles, depending on your weight on the Swagtron and with a top speed of around 15mph it's pretty fast for such a lightweight machine. I'm not sure that you would want to go much faster on such a light electric scooter. That said, I do recommend wearing safety gear at all times. There is nothing like avoiding bumps and bruises or worse when your traveling on a carbon-fiber super-scooter at 15mph. 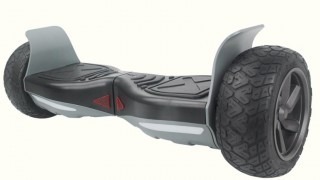 Swagtron have done everyone a service by bringing us this super hi-tech model at such a great price. No Ferrari? No it's a Swagtron and I have change to spare! Another quirky innovation from the well-known Razor company is this Razor EcoSmart Metro. 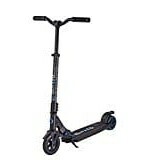 Its clearly designed with the adult metro commuter or shopper in mind with it's wide kickboard and old-school styling. This is probably a perfect ride for the whole family to share or an excellent substitute for a bicycle if you are an older rider. The bicycle-style seat and small cargo shelf are nice touches but it shows that this electric scooter is tailor-made to get to school or the market because you can strap your books or shopping on the shelf with ease. the Wide platform makes it easy to rest to big feet on as this scooter is not really designed to be used as a kick scooter. the large spoked bicycle-style wheels are very appealing as it the bike-style handlebars. It's a perfect transition electric scooter. If you're not ready for a hi-tech Ferrari model or a super-fast Elite Turbo fond elsewhere on this Top 15 Table then this Metro is your best choice. Everybody knows the Razor company, those guys are famous for their kick scooters and they certainly know what they are doing having taken the kick scooter world by storm for many years now. Razor introduced their first electric scooter back in 2003 so they have a long history of producing this type of machine. The E300 is a classic and one of Razor's top-end kids electric scooters. 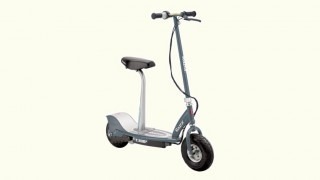 The addition of the seat and seat-post created the E300S electric scooter and suddenly this classic model became suitable for adults who like to have an easier time than kids who don;t often like to sit down! A lot has already been written about the E300S so I'll just stick to the main points. The first impression you get is that this is a very well-build machine for the money. It's made of steel tubing and has heavy Sealed Lead-Acid batteries under the kickboard which is extra-wide. The air tires make for a comfortable ride and the rear brake provides that element of safety when needed. 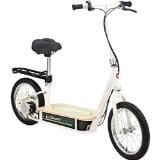 The V-1000 has a high-voltage battery and it's 36 Volts can deliver enough juice for the 500 watt brush-less motor to travel for up to 15 miles with a top speed of 20mph. This electric scooter is certainly no slouch. With it's aircraft-grade and strong aluminum frame, it's a lightweight scooter and that makes it a great commuter scoot. 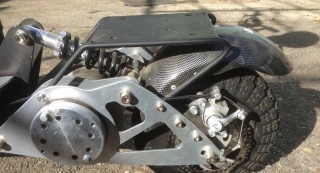 The Fuzion V-1000 has a disc brake on the rear wheel which is operated with the handlebar brake lever. A 6 months limited warranty gives you the confidence that if anything should go wrong with the manufacturing or components, you are covered. It's easy to use with just a single button operation, no straining your wrist on a motorbike-style twist throttle. Glion call their Dolly Electric Scooter the ultimate commuter scooter and it's easy to see why they make this claim. It is built to last and constructed with aircraft-grade, lightweight aluminum with powder coated and hard-wearing paint. It weights around 28lbs and they have a rather good patented dolly and upright standing system. This means no more struggling on the commuter train with a bicycle. 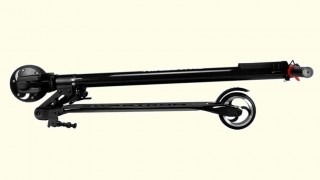 The Glion dolly folds down in 1 second making it incredible easy to unfold and go. Storing it upright on the train, at home or in the office makes the Glion especially space-saving while it charges. The 8 inch tires provide a comfortable ride and it has anti-lock braking technology for safety in those tricky moments when a collision is on the horizon. The Glion's 250 Watt motor is located in the rear wheel hub and is powerful enough to transport you up to 15mph with a range of up to 15 miles on full charge. that should make it easy to get to the office and back home again. 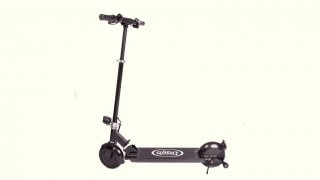 The famous Brand of self-balancing scooter Segway have produced this incredible high quality miniPro. Created for professional use, the miniPro is made by the company that made self-balancing scooters long before the word Hoverboard was coined. 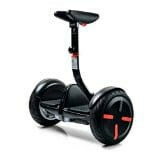 Segway's are typically different to a Hoverbard because they usually have some kind of handlebar or knee-grip and their wheels are much larger than a regular Hoverboard. The wheels are larger, the construction materials are better quality and the overall machine is in a different league to most Hoverboards. This is why I have included it in the electric scooter comparison table. As the Segway is also generally built to be a professional use vehicle they are much more expensive than any self-balancing hoverboard scooter. It's not uncommon to see Mall Cops and Airport Security people riding Segways because they are quiet and convenient. This miniPro model features a neat smartphone app that you can use to lock the machine or control it remotely. It's good to have an anti0theft device on-board and the knee-grips provide that extra stability you need for a comfortable journey. Can anyone imagine commuting to work on a Hoverboard? I don't think so. However the Segway miniPro is an entirely different matter with it's large wheels, great battery life and pro construction. 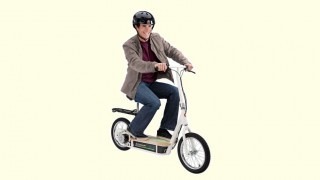 Of course, you can always use it as a toy if you feel like a special gadget to cruise around the neighborhood on. Why not? For hands free electric scootering, you can;t do better than a Segway. Why Are e-Scooters Such A Hit Personal Transport Vehicle? I thought it a good idea to answer some questions that people ask when looking to buy an electric scooter. Some of the points I make below are for fun and some answer more serious questions. First of all, let's get back to basics for those that need to know. 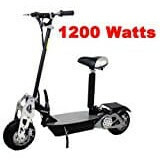 What Is an Electric Battery Powered Scooter? So for those of you that need an actual definition, perhaps because you're trying to explain to a parent or a loved one what an eScooter is. I can imagine that there are plenty of kids out there who are trying to explain to a grandparent why they need one of these as a gift. So here goes for a concise description that you can use when talking to a potential gifter. What's The Difference Between an Adult Version and Child or Teen Product? Similar to other types of vehicles or ride-on's you need to make sure you get the right scooter for the right age of rider. Adult e-scooters have a greater weight capacity, meaning the rider can be a lot heavier. Adult version tend to be more expensive because the range, speed and power will all be suitable for an actual short journey rather than just a quick scoot around the yard. especially for those who are having doubts in regard to buying an electric scooter. It's important to pay attention to the details when choosing an electric scooter so that you don't buy a kid's one by mistake' or vice-versa. 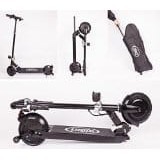 The comparison chart above has details on each of the top scooters and will help you be sure that you are buying an appropriate model. Although a child will be delighted to receive an adult electric scooter as a gift, because it will be more powerful than what they were expecting, as an adult you don't want to be seen travelling to work on a Razor E100. 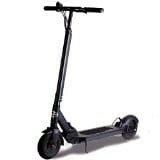 I aim to make is easy and convenient for you to pick the right electric scooter for your particular circumstance. 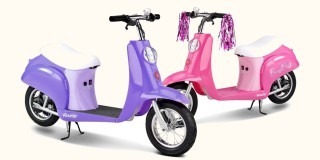 Another giveaway is that the children's scooters tend to be smaller and available in a wide range of colors. As rechargeable battery technology keeps improving, so these vehicles will keep improving along with these technological advancements. I really believe that this will change in the coming years as battery tech advances. Just consider the first mobiles phones that were encumbered by their huge batteries. Well it's clear that cell phones are now tiny and this is due in large part to battery technology. Interestingly it's cell phones and more recently electric cars that have driven the innovation. Electric scooters have been a significant beneficiary of the developments from other industries. The recently safety certified Swagtron T1 hoverboard has become enormously popular because it is one of the first to be L2272 certified. 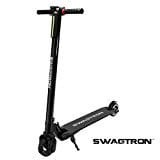 This Swagtron T1 is on sale now on Amazon. 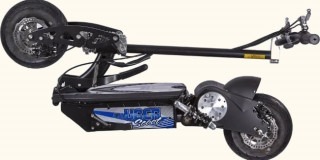 The Uberscoot 1600W is quite amazing for it's sheer power. the specifications for this machine are quite incredible and it deserves it's title as the most powerful adult electric scooter on the market right now. We look at the baby brother of this monster machine in our Uberscoot 1000W 36V Electric Scooter review, but here we are really talking about a monster ride. 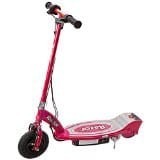 If you would prefer to have a non electric kick scooter, you can find out what to look for when comparing the best kick scooter for adults. The electric scooter is also fun for people who are commuting to work because they can have an enjoyable ride. More on this later. Why Do Children Enjoy Using Them? Plus, when you are at work, you can park your scooter at work next to your desk. You can get one of those folding scooters which can sit next to your desk. So there are no worries involved with riding your scooter to work. If you are comparing the electric scooter to other forms of transport, then the electric scooter definitely meets the standard for an environmentally friendly mode of transport. You can use the scooter without any noise, and there are no toxic fumes. Why Should You Buy An Electric Scooter? There are many reasons why you should consider an e-scooter purchase, not least because they are eco-friendly when compared to a gas-powered car. I have heard some interesting justifications for buying an expensive electric scooter but these were mainly people who needed to justify the purchase to their better half! The reasons below are more general than that but may still help you of you are in a tight spot with your significant other. I'm sure that you know these points already but here's a reminder and a rundown of the the most important reasons to buy an electric scooter. There are of course, many more reasons to buy an electric scooter than these. This list is just a starting point and everyone has their own individual needs. The point here is really that e-scooters are a great development in personal transportation for adults and kids that don't expel poisonous gas fumes into the atmosphere. Here is a rundown that attempts to give some quick notes on what is a gray area for some - Is It Legal to Ride Electric Scooters in the United States? This is one of the questions our readers across the US have been asking for some time so I gathere information form various Cities and States. Although I've given the best possible answers that I can, in no way should the notes below be taken as legal advice. You need to check the local transportation laws in you City and Sate to be sure. Legally What are Electric Scooters? Before we go into details of whether electric scooters are street legal, let’s first understand what electric scooters are as far as the law is concerned. Below are 10 US States and Cities and their Regulations. You must hold a valid Class M/MJ or Class 1 driver's license to legally ride an electric scooter in the state of New York. Registration is required and normally follows the same requirements as a New York motorcycle license. In the state of New York, a valid insurance is required for you to ride your scooter on public roads. Once your scooter is registered, inspected and you have a license, you will be ready to legally operate it. Mopeds and electric scooters are intended for limited operation on public roads in Illinois. If you are planning to ride your electric scooter on the state’s public roads, the state law requires you to hold a valid driver's license and abide by all road signs and traffic laws. Registration and titling are required to operate your motorized or electric scooter on Illinois roadways. Registration may be done in person, online or mail at your local Secretary of State (SOS) office. In Florida, drivers must be at least 16 years old and have a valid Class E driver's license to ride an electric scooter in the state of Florida. No registration, insurance or license plates are required. Each city allows drivers to ride their motorized scooter on certain locations only but not on the sidewalks. In California, drivers must be at least 16 years old and hold a valid driver's license or learners permit in order to legally drive an electric scooter on public roads. No registration, insurance or license plates required. The state law also requires all drivers irrespective age to wear a helmet while riding. Also, driving an electric scooter in excesses of 15 mph will result in speeding ticket penalties. All electric scooters must be operated on a bikeway, trail or bicycle path, and not on a sidewalk. On the roadway, it must be operated in the bicycle lane. It is legal to operate an electric scooter in San Francisco. The City Council has made it legal because of the busy life of various city communities. However, as a rider, you must be at least 16 years old and hold a valid driver's license or learners permit in order to legally drive an electric scooter on the city’s bikeway, trail, sidewalks or bicycle path. On the roadway, it must be operated in the bicycle lane. The City Council also requires all drivers irrespective age to wear a helmet while riding. Because San Francisco is one of the most congested cities in the USA, riders should not ride their motorized scooters in excess of 15 mph. I do hope that you enjoy reading our in-depth reviews of the Best of Ride On Toys, including Adult Electric Scooters and The Best of Kids Electric Scooters. Ride on people! Electric scooters are a great eco-friendly way to get around!